I am writing to you as a citizen of Ontario regarding my deep and thoroughly-examined concerns regarding the direction of this province that I love and have been, generally, proud to call home. I have a particular perspective – as a former educator (from a family of educators) and as someone who now works within the public health care system – that I’d like to share with you. Please note that this letter is directed to you as Deputy Premier, not as Minister of Health and Long-Term Care (although that is pertinent to my concerns, as you’ll see), since I see no value in writing to the Minister of Education or the Premier, as neither has demonstrated any depth of experience or pertinent insight in the roles to which they have, beyond all understanding, been elected and/or appointed. I’ll abstain from any further comment about their lack of overall competency, since such is self-evident and clearly demonstrated every time they open their mouths. As health care workers and community members gather in front of Queen’s Park to demonstrate their outrage at the closing of overdose prevention sites, and as Ontario students prepare to use their informed and concerned voices and walk out of classes across the province this afternoon, I feel I can no longer remain silent without asking you – an experienced public servant – to provide the rationale behind your continued support of this government’s increasingly-egregious agenda. Despite differences in political ideology, I have held you in a position of respect over the course of your career, particularly as you acted as Patient Ombudsman for the province of Ontario. In that role, you acted as a non-partisan representative of the people of Ontario, providing us with a strong voice to express concerns about the direction of our public-funded health care system. I watched the leadership race last year with the hope that your experience and preparedness would assure us of competent direction (despite our differences of opinion – the carbon tax, for one) as we entered a sure-to-be-contentious election. I was dumbfounded and disheartened by your defeat – not least because, as a resident of Toronto I have far too much experience of the type of politics played and the “leadership” displayed by your opponent. The lack of relevant experience and sound-bite-based campaigning, along with ill-examined irregularities in the voting system, permitted a questionable ‘businessman’ to lead the Ontario PC Party to the Legislative Assembly. I admit that I, like many who found this turn of events inexplicable, took some comfort in your appointment as Deputy Premier and Minister of the MOHLTC, counting on your knowledge and background to mitigate the most dangerous planks of the newly-elected Premier’s heretofore unexpressed platform. It has taken a remarkably short time for such hopes to be dashed, and I, along with much of the rest of the province, are left to wonder, with concern, at the silencing of the integrity and ethics you demonstrated previously as a long-time participant in public service. I could go on for page after page regarding my concerns about the policy decisions this government has made (the change to our license plates would barely merit a paragraph – nonsense of that nature is hardly worth the effort of commentary – although I’d like to propose DoFoMustGo as an alternative to the crassly-commercial and self-interested ‘open for business’, since one is as nonsensical as the other), but I will focus on those two perspectives I referenced above – education and health care. It is more and more apparent that this government is interested in preparing our children for futures that seemingly require no exposure to higher critical thinking skills or to a balance of STEM courses and humanities classes that teach important values that help to describe our society and to highlight the places that call out for improvement. In making cuts to university funding, and imposing online courses for high school students, this government seems to be supporting the creation a future population that would be disconnected from the larger community and what it means to be citizens of Ontario, Canada and the wider world, and blindly accepting of the political rhetoric used to defend policies geared toward the benefit of a minority of citizens. In my time teaching undergraduate courses at a number of Ontario universities, I saw a steady decline in some basic skills – reading comprehension, argument-support, effective citation of sources, as examples – with the removal of grade 13/OAC under a previous Conservative government. I fear that the results of your government’s proposed changes to our education system will have deeper and more problematic consequences than even that decision. That said, the students are best-placed to vocalize their concerns about their education, and, despite the claims of the Premier that the walk out is a political contrivance of ‘the unions’, they are making it clear that they will not be ignored when detrimental decisions are being made on their behalf. They demonstrated that with a similar walk out to express opinions regarding the province’s health education curriculum. They were heard then, and once again they are saying ‘no’ – emphatically – and if Ontario Conservatives decline to hear that declaration, I don’t believe that this government’s relationship with the people responsible for the education of our children – or the children themselves – will permit anything other than considered and intentional regression. I ask you, as Deputy Premier, to ensure that this government starts listening to the relevant stakeholders – with the most to gain or lose – regarding changes to education in Ontario. It seems that the Premier and Minister of Education are unwilling to do so, and it is increasingly apparent that they do not have the expertise to guide progressive reforms without more informed – and educated – support. With respect to changes coming (regardless of input) to our health care system, I have only one request to share at this time. Please uphold the necessity of consultation with relevant stakeholders prior to the institution of Bill 74. Two-days notice (I’m being generous there) for public hearings – ONLY held in Toronto – is appalling. As is the fact that over 1400 requests to present were received, and 30 representatives were invited to participate. And the fact that the rush to pass this legislation seems unprecedented in its haste. To say more than that may endanger my current job, and being jobless in this government’s Ontario is a terrifying prospect. I ask you, as one professional, engaged Ontarian to another, to hold to account the Premier and his Ministers in the same way that you have done in your past, much-appreciated, public service incarnations. If you cannot do so, I’d appreciate hearing your reasons why, outside of the environment that requires standing ovations and toeing of party lines, regardless of evidence-based assessment. It’s true. I can’t. If there is sense to be found in most of what is happening around me right now, I’m sure as hell not seeing much evidence of intelligible reality. What I am feeling is lost – amongst the credulous, self-serving, soporific-imbibing portion of the population that saw/sees the current POTUS and Premier of Ontario as viable candidates for leadership. I don’t like feeling lost. It makes me angry. I don’t think I’m alone in that since the world of social media is mostly vitriolic ranting these days. Some of it, to be sure, is justified. We need to rage against inequity in all its forms and the normalization of criminal behaviours and the spread of hatred. Most days it feels like demoralizing shouting into the void. Evidence piled upon evidence that we remain in the Age of the Selfie – encouraging the priority of the few – those who continue to control the narrative and the purse-strings – over the well-being of the rest of us. But this post is not, really, about how loathsomely inexplicable I find those who maintain their support of the jackasses-in-question – and I admit that our local jackass has been garnering the lion’s share of my focus lately. The ‘Murican jackass is a danger to us all, there is no doubt about that, but I can focus on only so much soft-headed tomfoolery and criminality posing as government policy-making without needing a good long lie-down. The DoFo ‘administration’ is poised to do irreparable damage to my city and my province and the 40% of the population that voted for him and his ilk are still buying the soundbites, petty proclamations, and bread-and-circus routine that are the only tools he can command in light of his complete lack of talent, insight, sincerity, and experience. He needs to be the focus of my complete opposition right now. And it’s not about the horror I feel about the latest revelations regarding the cover-up of abuse in that anachronistic institution of equal parts illogical doctrine and outdated power structure OR the outrage against those that are spinning Apologetics that suggest fabrication and exaggeration, calling the evidence ‘myth’ – ‘fake news’, if you will – and saying that no institution has LESS of a problem with the sexual abuse of minors than the Catholic Church… I feel like I’m the embodiment of the rage emoji. These things – serious, deleterious, and potentially-irrevocable as they may be – along with some others that are less-atrocious but annoying, nonetheless, have been causing me to react rather than act, lately. I could blame Twitter (and too much time spent watching that feed certainly is somewhat responsible), but the reality is that having so many things coming at me at once is contributing to a bone-deep anomie that has been hard to shake. This time of year is always reflective for me. I can’t avoid the back-to-school/new beginnings ideation that comes with the winding down of August. I’m sure it’s partly to due with the timing of my birthday (the start of my own, personal New Year), but, despite having not set foot in a classroom in 8 years, I still feel the pull of the new start that defined my life for so many years. That 8 years thing is also interesting. 8 years ago was a milestone birthday, and, on a lovely celebratory getaway with one of my sisters, I spent a lot of time assessing my life as it was and contemplating next steps. The upshot of all that evaluation was a full-on change in career, along with some other life-altering decisions that are still rippling back at me now. Cycles and such. 8 strikes me as less-symbolic a number than, say, 7 or 3, but I’m sure that some numerologists out there attach a divine importance to 2X4. Regardless, here I am again. Change. Decisions. New directions. I’m starting a new job – on yet another career path – right after the long weekend. I’m excited and hopeful and feeling that the challenges will be good for me. I’ve been stagnating for too long. And I’m thinking, in general, about all those things that aren’t working. Some of the things requiring assessment are the same as they were 8 years ago. I can be a slow-learner, at times. This is not always the most pleasant of exercises, but, if it helps me shift from reacting to acting in my life, it will be well-worth the self-examination. Change can be hard. I think my Virgo-nature (or, if you don’t believe in horoscopes – full disclosure, I don’t – my tendency to stubbornness) makes change even more difficult. But, if I’ve learned anything about myself over the past decade or so, I can roll with punches. I don’t like it, but I do it. Change and chaos – that foundational element of human understanding of the world – are inextricably linked. I think that’s why we struggle with it so much. Chaos gets a bad rep. I lost my own little personification of chaos – my Tiamat – back in June, and I did not enjoy coming to terms with that change at all (Canaanite kittens are helping with that, though). I know, because of all those years studying the stuff, that chaos is necessary. Without its latent presence there exists nothing but stasis. Too much is problematic, of course, but we need that trickle of unsettled alteration to drive progress and our work towards better things. I think change is most difficult when we are in a situation of instability that permits chaos to seem on the ascendent. As the Mesopotamians told us over-and-over, the balance needs to be maintained. For that to happen we need to have clear standards of order. Right now? We do not. Those systems to which we cling for stability – our governments, religious systems, social organizations – they’re the very things creating the anomie and imbalance. So what do we do when we isolate ourselves – behind phones and screens and pseudonyms – and our social structures fail to support our ideals and expectations? Order and chaos is an important foundational dichotomy – more effective and representative of human nature than its later interpretation as good/evil. Not all dichotomies are bad. Some are, though. Good/evil is not useful at all. The narratives that one drives are ALL problematic, as I see things. And even worse than that one is us/them. I hate us/them. Us/them is creating far too many narratives in our dysfunctional governance and social-interactions. We’ve lost all sense of the importance of caring about one another. Community is a concept that seems archaic – unless it is insular and exclusionary. Then we’re okay with it. We are so self-consumed that the thought of providing support to those who need it most is displaced by the selfish (and ridiculously unsustainable) desire for cheaper gas and beer. Relationships – created and dissolved online – are as disposable as the lives of people seeking sanctuary from war-torn places (despite the fact that we are culpable for the origins of those wars). The dynamic has shifted – rapidly and unfortunately. And if we do not feel supported by those around us, the waves of chaos are hard to navigate. The feeling of disconnection is, if I’m honest, at the heart of my current self-search. Dissatisfaction is often isolating. One feels like one can only complain so much – before becoming burdensome or dismissed or just plain boring. This week I was part of an example of the opposite of disconnection, though. And it has taken my reflection in a different direction in a matter of days. I was privileged to grow up in a village in the heart of the country’s largest city. Decidedly (at the time) middle class, it was a wonderful environment – generally speaking. We had multiple parents looking out for us, close friendships that persisted from JK through high school and beyond, and a sense of safety that permitted us to run loose in adventures that rarely ended in injury or other harm. I will refrain from discussion of the sprained ankle and broken arm, both of which I blame on one guy in particular. That guy grew up around the corner from me. We were in the same class every year from K-8, shared multiple classes in high school AND spent summers together at camp – as campers and on staff. He is a featured player in a ridiculous number of my best memories. And some of the worst ones, too. Maybe not quite a brother, but certainly more than a friend – in spite of the aforementioned injuries. To be fair, I was present for some pretty serious ones that he sustained, as well. He moved to California a couple of decades ago, so we haven’t seen all that much of each other in the last while. One morning this week I woke up to an email from him. He’s been up at his folks’ cottage on Georgian Bay and came across three boxes of stuff marked ‘do not throw out’. Photos, letters, year books. I was on the receiving end of much of that discovered bounty three days running this week. He’s not on social media – can’t say as I blame him when it’s as much a burden as a benefit lately – and he was hesitant about how/if to share some of the things he was finding. I made the decision for him – and posted two class photos from our primary school days. I added to the initial two as he forwarded more. That thread now has 163 comments and has spawned early plans for a reunion in September. As he said, in an email when I told him what I did (easier to apologize than ask permission, and all that) “If it gives 1 person (or a bunch of people) an ‘excuse’ to reach out and connect with old friend/s… long lost friend/s… a brief escape to happier & NO RESPONSIBILITY times… then we’ve done a good thing”. His assessment might be a tad more idyllic in retrospect than it was in reality, but he’s not far off. Right/wrong is another of those dichotomies that serves a purpose. The response to the pictures demonstrates how lucky we were – and how we all seem to know that. We were, then, part of a community, and we remain, now, connected because of that community. Perhaps it’s that time of year for everyone. I know I needed that reminder, in a week in which I lost the last of the ‘old folks’ who helped raise me, and as I contemplate changing up some personal relationships that sit in a stasis that is disallowing change and growth and/or just plain hurting my heart. The world does, for the moment, continue to spin, and I am – we all are – part of it. The only way to balance the chaos of the world is to establish – or re-establish – those connections and communities that lead to stabilizing order. We need to remember that we all have to have look out for one another. There is no them, there is only us. Maintaining our connections is work – but it is worthwhile work. Thanks for the perspective, JAS. Maybe brother is the right word. I know our neighbours to the south are dealing with an inexplicable situation at their highest levels of government and I honestly don’t get how it can even be happening. I don’t know enough about how the system works- certainly not enough to understand how federal employees can be thrown out of work when a minority of extremists shut down the business of government based on even more inexplicable attitudes about points of policy that the electorate seems to favour- and, to be honest, I have neither the time nor the heart to research the situation in any depth right now. I have read various takes on the insanity by some of my fellow bloggers- who, as Americans, know way more about it all than I would ever claim. The most I can take personal issue with is SNL’s (hilarious as always) Weekend Update examination of the sitch- which blamed us here in the Great White North for the whole thing. While you all were distracted by Iran and North Korea, a Canadian shut down the US government. Please. We don’t lay any claim to that Senator Cruz guy. Even if we wanted to, you’d have to convince me that the majority political/ideological ideals out of Calgary are representative of Canadian political sensibilities in the rest of the country as a whole. They certainly aren’t representative of mine. That Harper guy spent his adult years there (I don’t count his early childhood in Toronto. Would rather forget we hail from the same neighbourhood, actually) and represents the city in Parliament. Their current mayor (who is AWESOME) notwithstanding, Albertan politics are faaaaaar more right-leaning than I am remotely comfortable with. Cruz seems fairly intent on playing down any Canadian-ness anyway. He wants to be President, so the ‘natural born citizen’ thing necessitates distancing himself from us. Which, given his 21+hour performance in the Senate a few weeks back, is okay with me (and most of the people I know here at home). We have enough insane politicians of our own. The local 6 o’clock news started off by telling us the actual dollar figure that the taxpayers of Ontario are paying as a result of the Liberal government’s decision to cancel the contracts for a couple of gas plants in advance of the last provincial election- in a bid to guarantee two (yes TWO) seats. 1.1 billion (yes BILLION) dollars. And if they’d just held off and let the proposal expire, it would have cost NOthing. All in the name of political expediency. Story number two? City council back to the fighting board regarding the idiocy about the Scarborough subway– and how to pay for it. I especially love how the Brothers Ford attacked Paul Ainslie- who actually represents Scarborough- for suggesting that a subway isn’t the most cost-effective solution to the need for public transit in the city’s east end. He’s FROM Scarborough. What could he possibly know about his constituency? The Bros from the ‘Coke (on the opposite suburban side of town), as usual, know best. Number three? One of those same Senators who have been all over the news lately for wrongly claimed expenses? He apparently paid a friend $65,000 (of taxpayers’ money) to do, well, nothing. I guess I am either completely naive and clueless- or maybe just not quite cynical enough- but I honestly was of the opinion that people went into public service- as bureaucrats, policy makers and, most certainly, elected officials- in order to benefit society with the skills and perspectives they have to offer the general population. Needs of the many over the greed and expediency of the few, as it were. Not feeling like there is anything like truth in that particular belief these days. Those who are drawn to public service lately seem to be attracted solely by the benefits and stability of government jobs- and those who run for office cannot possibly be considered altruistic in their motivations or actions anymore. Maybe they never could. I’d like to think that we have had public leaders who actually care about the public. But whether or not history can back me up on that, the currently reality says it is now otherwise. Don Quixote, that pivotal, incredible staple of the Western Canon, tells the story of the idealistic and noble-of-spirit Man of La Mancha, who set out to perform acts of chivalry- those tenets of knighthood that focused on gallantry and service to others- in the face of constant deception and humiliating criticism. Under the influence of Medieval tales about chivalry- and its lost values- Alonso Quijano remakes himself as Don Quixote and sets out to return the ideals he admires to a world that has ceased to value such things. Miguel de Cervantes’ novel is so rich with characters and wonder and meaning that interpretations of his masterpiece are diverse and often disparate. To me, the character of Don Quixote demonstrates- repeatedly- that individuals can be right while the larger society is wrong. Unfortunately, like Don Quixote, such individuals are all too often viewed as ineffectual- if not completely crazy. Ultimately his idealism is defeated by mundane realities- and by the grasping greed of those around him. Even his patient squire, Sancho, tricks Don Quixote and earns himself a governorship (albeit a false one), in Part 2. Don Quixote serves as social commentary and a satirical view of orthodoxy, nationalism and the pitfalls of slavish conformity to ideas of ‘truth’. The putative knight sees his idealism dashed and finally- upon his deathbed and return to ‘sanity’- he renounces his attempts to restore the moral system of chivalry and apologizes for the trouble he caused. This recanting is the real tragedy of Don Quixote. Among other things, the chivalric code stated that its followers must protect those who cannot protect themselves- including children, widows and the elderly. Chivalrous knights were all about honour- and respecting and protecting the honour of women. They persevered and saw all tasks through to their conclusion. And they despised pecuniary rewards. Neither Don Quixote nor the knights he emulated were in it for the power or the money. They did these things because they believed that they were the right things to do. Yet such examples became ideals to be mocked in the face of the common reality. 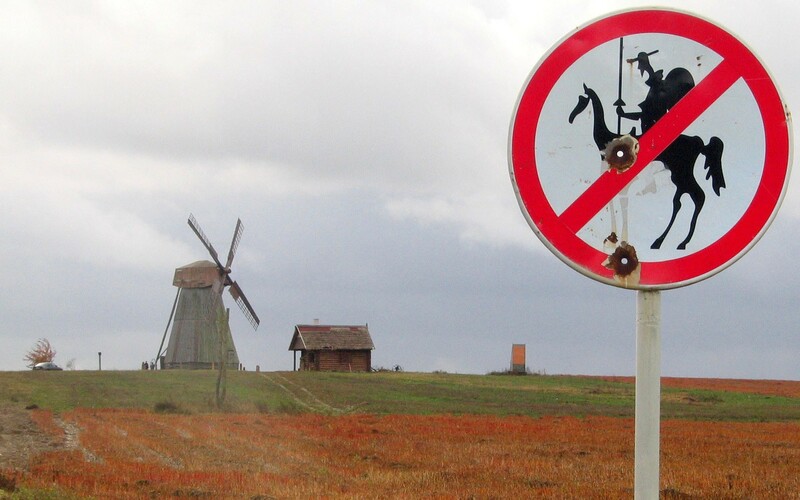 To be quixotic is to be ‘overly’ ideal- that is, to subscribe to lofty or romantic ideas without regard to practicality. To be quixotic is to be naive or impulsive. I think that Don Quixote has gotten an historical bad rap. In the context of the novel, those who tilt at windmills are perceived to be vainly fighting against an imagined enemy based on misinterpreted idealistic justifications. But it can also be used to describe engagement in a fight in which the imbalance is pronounced- a lone man on a horse with a jousting lance against the power of the wind that causes the blades to continue turning. Even if he is the underdog, the idealist sees the battle as one that must be met. I don’t think that the adversaries are imagined. I think our elected leaders have lost all sense of the honour that must, of necessity and design, come with public service. I might be an idealist, but I think that my expectations of those who we choose to be put in charge are justified and in no way unreasonable. I also think that those sensors that alert us to excessive manipulation are firing in a big way. We have hit the tilt warning and it’s past time to stabilize the pinball machine of governance. Our leaders must be held accountable and lose all those bonus points that were not earned through real skill or the honourable playing of the game. Forefinger on the button, is he blue or is he red? Nik Kershaw’s 1983 song was written in the context of the Cold War, the threat of nuclear annihilation, and politicians and politics in the US and USSR. More than a little depressing that the themes are still applicable, 30 years later.